Former Manchester United captain Gary Neville expects more than the attackers of the team. He advised them and the coaching staff to learn from the actions of Liverpool`s offensive players. I expect more than the attacking trio of the team, Neville said in his regular commentary for Sky Sports. `I want to see more flankers coming to the center by Romeo Lukaku. Anyone in these positions - Anthony Marsial, Marcus Rashford or Alexis Sanchez - must break through. See how Sadio Mane and Mohammed Salah do in Liverpool. I`m not saying that they should not stand on the flank, but ultimately they have to go to the ball. The former England national even set a specific target for those attacking competitors. These United players have so many classes. But they have to get more. The two flank players have to make 20 hits per season, and Lukaku will add 25. These are 65 goals that are there and must be made. 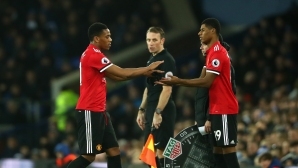 Yes, Rashford and Marcial are still young and prefer to be central strikers, but they should draw the best. Both can much more, and this is not a critique of them, but a compliment because I see their qualities. They also need more self-confidence, Gary Neville added. On Saturday, Manchester United missed Chelsea as a guest - 2:2, and is 9 points from Manchester City and Liverpool.